Richard H. Sylvester, “Richard H. Sylvester,” Histories of the National Mall, accessed April 22, 2019, http://mallhistory.org/items/show/154. Sylvester was the Chief of Police in Washington, DC, during the Woman Suffrage Parade of 1913. The women were harassed by a large crowd of mostly male onlookers. Instead of protecting the marchers, the police failed to intervene and at times joined in on the attacks on the women. 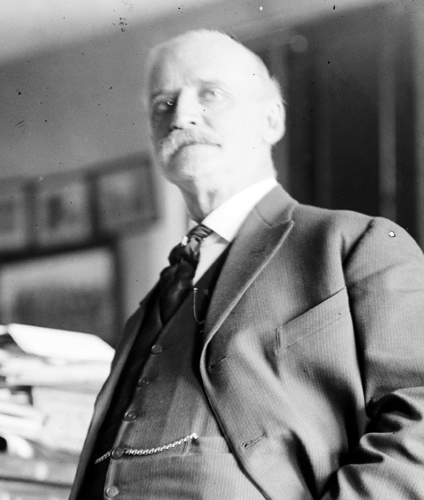 Eventually, Sylvester requested help from Secretary of War Henry L. Stimson, who authorized US Army troops on horseback from nearby Fort Myer to help with crowd control. In 1915, formal criminal charges were filed against Sylvester for the incident and he resigned from the police force. Born in Iowa City, Sylvester attended Washington University in St Louis, Missouri, but dropped out before completing his degree to work as a journalist. He came to Washington at age 20 to work as a correspondent for the St. Louis Times. In 1882, he accepted a one-year appointment with the Bureau of Indian affairs, working in Colorado and Utah, and continued to write articles for the St. Louis Times and other newspapers. After Sylvester returned to Washington 1883, he started a new career as chief clerk for the Washington Metropolitan Police Department. He rose through the ranks as a major and then superintendent. He became Chief of Police in 1898, a position he held for seventeen years. During this time, he also served as the first President of the International Association of Chiefs of Police. Following the 1913 Woman Suffrage Parade, when police failed to protect the marchers from citizen attacks, the city launched an investigation over his and the department’s conduct. Formal charges of official misconduct during the Suffrage Parade were filed against Sylvester by the city in 1915, at which point he resigned. He then became the chief of the protection division, or internal police force, of the duPont manufacturing plants in Delaware during World War I. In 1918, Sylvester’s team uncovered a plot by saboteurs to replace the contents of fire extinguishers at duPont factories with gasoline. Sylvester retired from duPont in 1934 and died three weeks later.